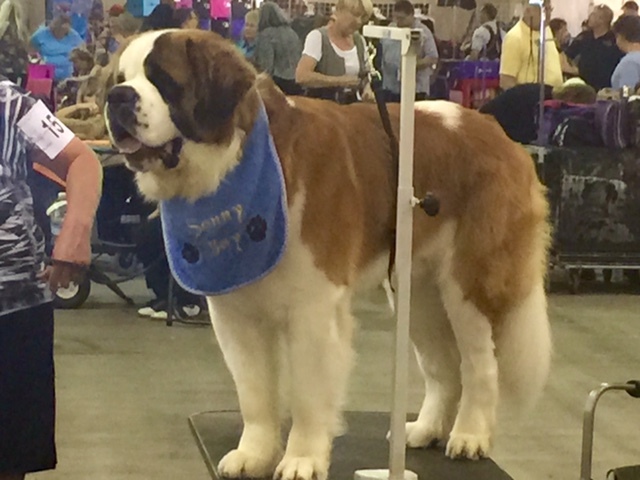 The Sacramento Kennel Club puts on a two-day dog show every spring. I’ve gone to it two or three times and I have a big goofy grin on my face the whole time I am surrounded by all that doggone fun. How could I not be grinning after seeing a face like this one? It was puppy-love at first sight. The American Kennel Club, like many clubs are wont to do, has rules, regulations, bylaws, codes of conduct, policies, standards, statutes, guidelines, procedures, requirements, parameters, and the like. Every aspect of being dog-crazy, er, I mean dog showing, has a rule to go along with it. 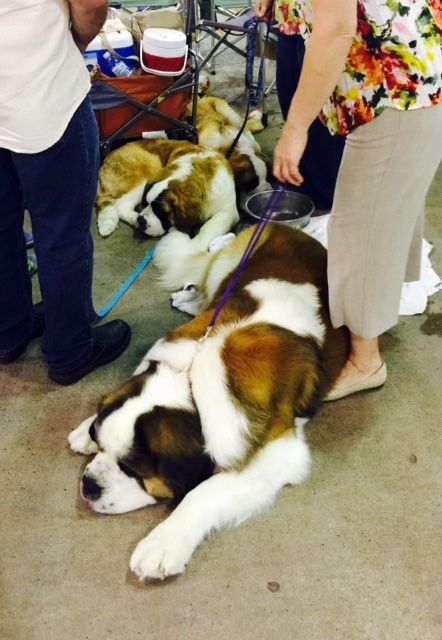 With all that writing and reading o’rules, one wonders when they have time to breed, train, handle, and show dogs. 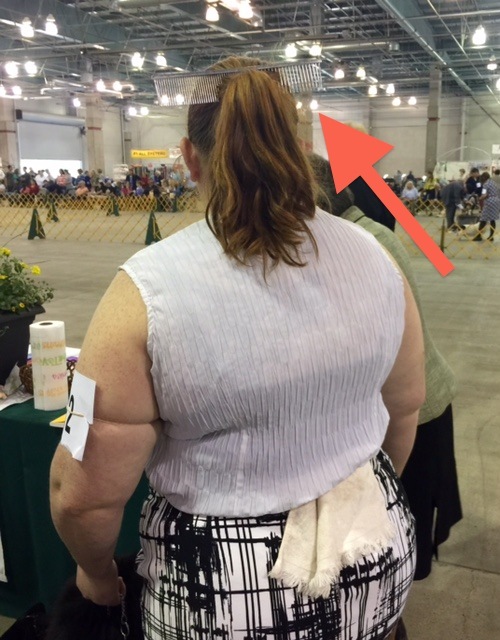 There are also many unwritten rules that dog show participants must adhere to. 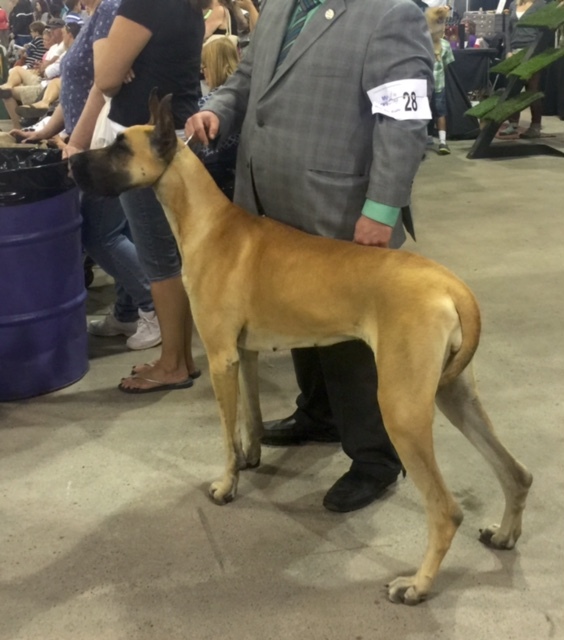 I set before you what you need to know if you want to enter the heady world of dog showing without making rookie mistakes and getting laughed out of the show ring. Your dog must be insanely adorable. You must tote around copious amounts of dog paraphernalia. Consider hiring a Sherpa. Dog grooming combs must be stored in your hair. Frequently use a drool rag to wipe off slobber. Dog drool and concrete floors are a deadly combination. Or feel free to humiliate your dog by making him wear a silly bib. Dog tattoos are a plus. Judges dig ’em. Mom jeans and sensible shoes are a must. 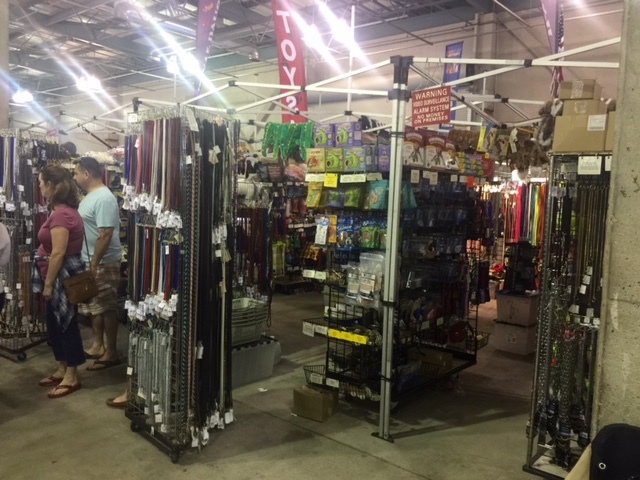 Shop at the dog leash emporium. Hire an animal communicator. I kid you not. 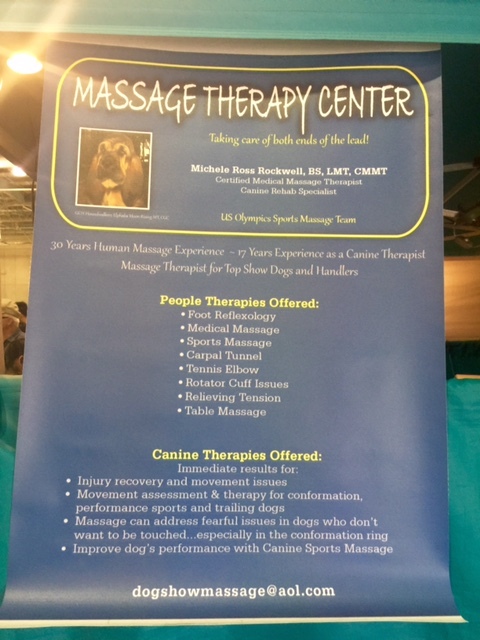 Book a massage appointment for your dog to relieve his stress so he performs in the ring to the best of his ability. Attend beauty school so you know how to properly style your dog’s hair . . . um, fur. Wait around . . .
And wait some more . . . 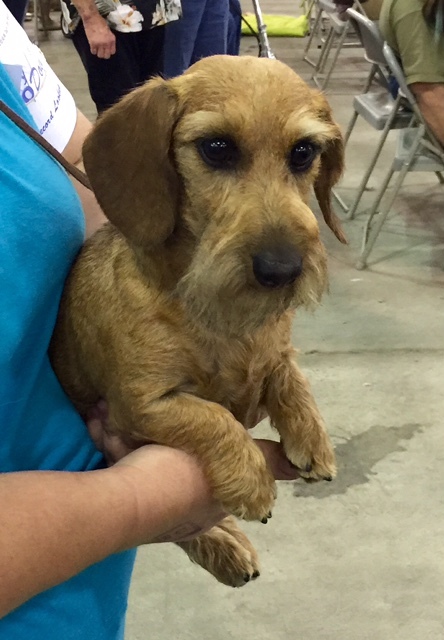 Honestly, if you have a chance to go to a dog show, I highly recommend it. It is DOG-some. My husband is a lucky man. I can hear you saying, “Why, yes he is! He is married to you, isn’t he?” That isn’t the only reason he is lucky. 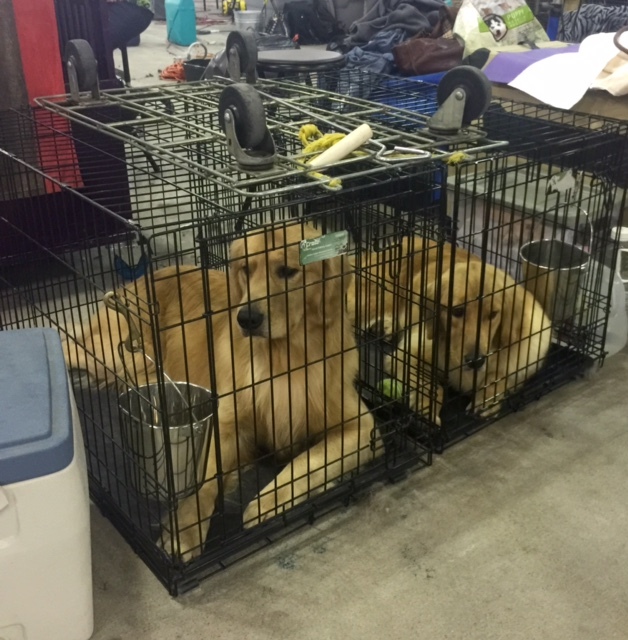 I came close to coming home with about two dozen dogs. But this guy, my Sir William Wallace, would be jealous if I did that. Aww! I’ve always loved dogs, even if I haven’t had one since my childhood pup passed. I’ve never been able to replace him. Maybe someday when hubs and I are retired we’ll revisit the possibility, though…. Did you see my note on your blog about the rioting in Baltimore? Are you out of harm’s way? It took us the longest time to recover after we had to put our dog Rosie down. The girls grew up with her and she was a special. I didn’t think I was ready but then William came into our lives because our daughter moved to a place that didn’t take dogs . . . and I am so glad he did. They do bring joy! I did see it! 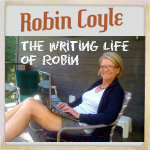 I’m just visiting other blogs first today before getting back to comments on my own. We’re fine here further west in the state. The riots are confined to the downtown area of Balto. But it’s all so heartbreaking. Just as in most conflicts, the issues are a complex mix of every shade of gray stemming from the earliest days of the American colonies. One hundred and fifty years after the Civil War ended, real solutions and progress still elude us. Yes, progress eludes us. There must be a better way to call for justice, reform, crime reduction, or whatever than burning down a CVS. Violence only sets back their agenda. They don’t kid around when it comes to dog shows, do they? I have never been to a dog show before (I don’t know if they even have them in my part of the world), but I would love to attend one some day. I spent a good few hours this weekend cuddling with my dog’s very fluffy dog, and whole show of them would probably kill me with all the adorableness! It was a few good hours of fluffy dog adorableness! They are so stinking cute! I’m surprised I didn’t plan a dog-napping. Aw, my pal, William, what a great photo of him! Really captures his essence. Sweet boy….On another note, horse shows aren’t that different but Woody isn’t jealous when I come home smelling like another horse. He’s just glad he wasn’t put through all of that nonsense! Be it dog-people, horse-people, cat-people, whatever-people, they are all a little crazy over their furry pets! William misses you! I’ve never been to a dog show. I didn’t realize they had all that extra stuff there, like a shopping mall and a beauty salon and a spa. If I tell my dog what she’s missing out on, I’ll never hear the end of it. Ha! William was mad at me for not taking him and then peeved that I can home smelling like another dog. I watch the American Kennel Show every Thanksgiving and one of my favorite movies is Best in Show. I could have 20 dogs if I had the space! They’re so adorable and they really strut their stuff when they’re out there, as if they know they’re the cream of the crop. Sounds as if you had a blast — I’d love to view one up close and personal. I’ve seriously thought of trying to come up with a line of shoes for these women that show dogs — you’re right, the shoes are pretty bad! The American Kennel Show on TV is a tradition for us too! And the Westminster. You could tell that the dogs knew they were supposed to show off. 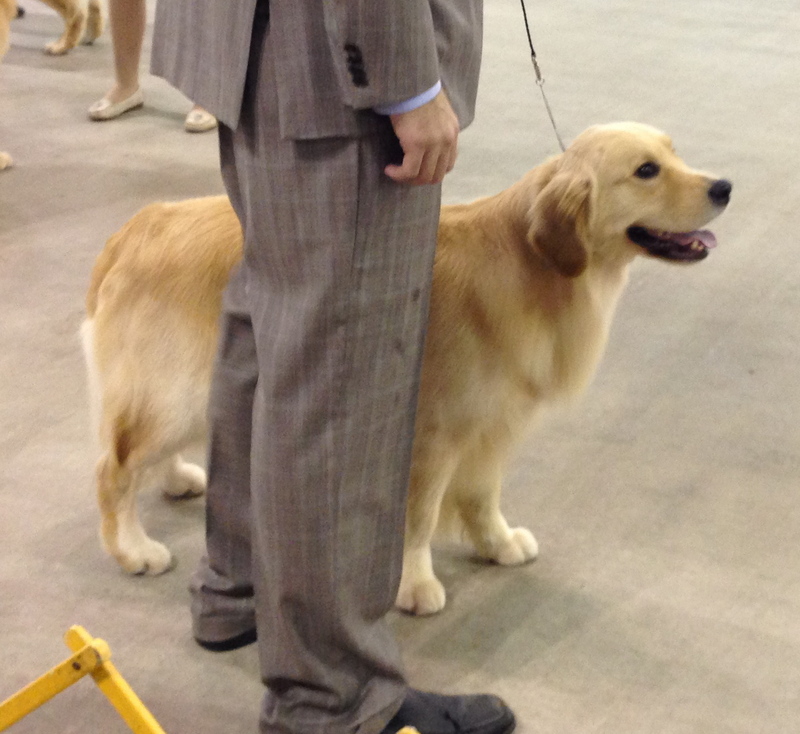 A handler I chatted with said her dog acts completely different when he is on his show lead versus a regular leash. Looking at the shoes on the women was like watching an episode of “What Not to Wear.” Practical, but a far cry from Jimmy Choo’s! I feel a bit sad when I look at the dogs being put through all that! They can’t enjoy it, can they? I guess they like some of the attention, but all that waiting around and stuff. I love your description of the essentials though. I heard about some research recently that said the hormone levels (I think it was hormones anyway, something chemical in our bodies!) that rise in mothers when they have a baby in order to cement the bonding with the baby, can be found at the same levels in some dog owners, which is why I guess people bond so closely with their dogs and literally do feel like it’s their baby! 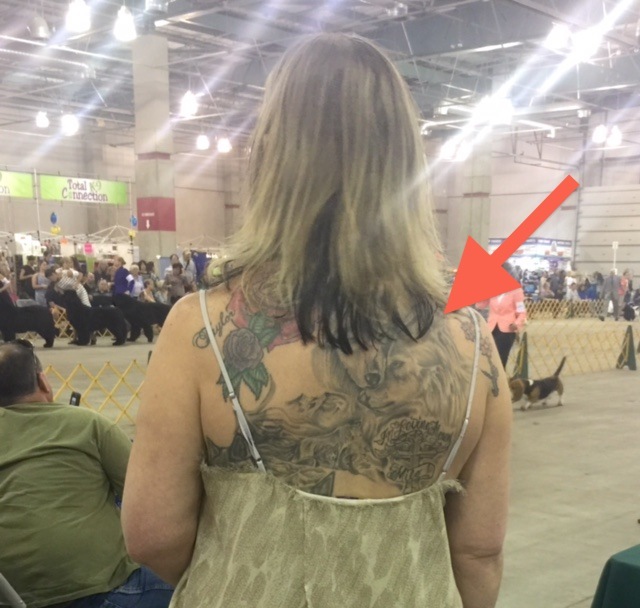 Oh, the dogs were into it when they were in the show ring. There was a spring in the step and if they won, they knew it! The waiting around must be a drag tho. 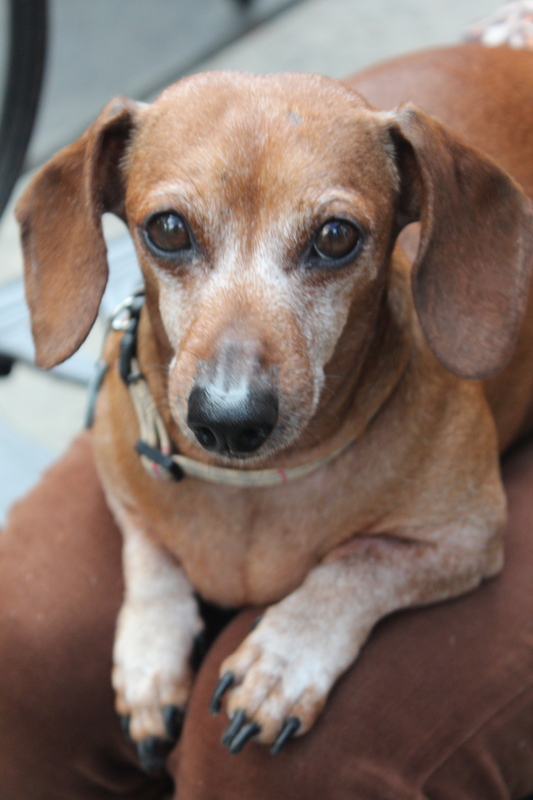 There have been studies about dogs bringing comfort to those who are grieving, lonely senior citizens, the ill, etc. There is even a program in some places where the judge will allow a dog to be on the stand with a child when testifying in court. There is some kind of magic there! You had me hooked from the start – as always! Awwww . . . you are too kind. Brilliance might be overstating it a tad. Can’t help but think of the movie Best In Show when seeing or hearing about a dog show. 😉 Isn’t it great though, being surrounded by all that furry love? I truly believe dogs are God’s gift to humanity. I LOVE that movie! It felt like I was in the middle of the filming of it. What a crack-up! Dogs tabled! 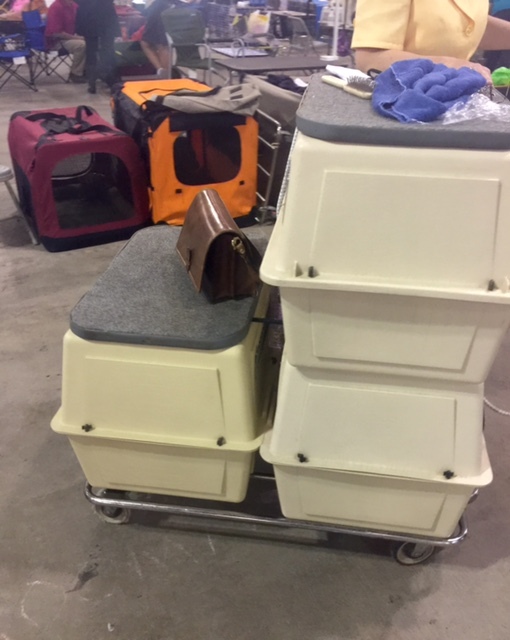 Backstage in dog shows are a whole different universe. When we purchased a Bouvier years ago for a guard dog, the breeder tried to pull us into that show world….it wouldn’t work. I have to hug and goo-goo “pretty baby” all the entries (not knowing letting a dog be a dog was discouraged), I couldn’t hold a dog in waiting on a leash for turn in ring without petting them and cooing over them (totally distracted the dog…forbidden) and would have had to find even uglier shoes. We were a disappointment. Guess we were lucky she didn’t demand the dog back. All Paws Up for this post! 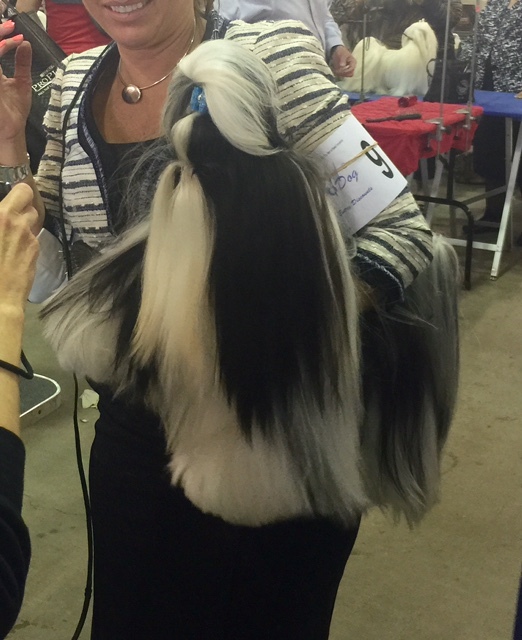 You have to be a special breed (no pun intended) of person to get into the dog show world. It is a way of life for them. I’m a dog lover, but that whole scene doesn’t interest me. I do love going to the dog show though. It was a fun way to spend an afternoon. William was highly suspicious when I came home with dog smell on me. DOG-some? Really? I expect better punning from you, madam. That said, my heart melted a little with that “insanely adorable” pooch. You are soooooo right! Silly me. I should have said, “PAW-some.” I stand corrected. Um. Yes. That is so much better. You always keep me on my toes! 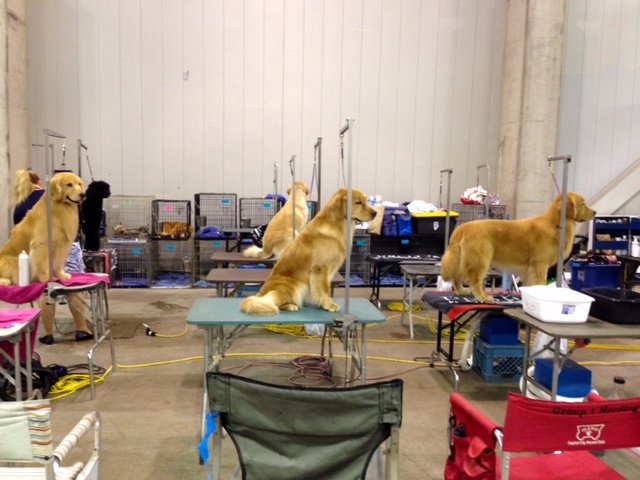 I would never thought a dog show could be so interesting and funny, it certainly was with you as the travel guide. That comb is bigger than my pea head! How did you sneak up on me in my mom jeans? You must always stay true to Sir William..he is way cuter! 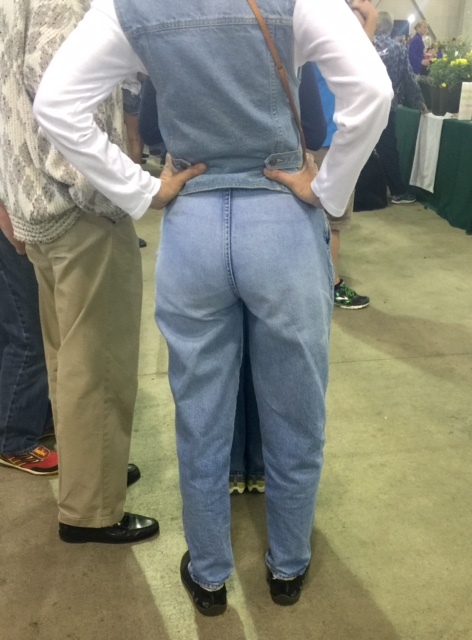 You look darling in mom jeans! So 1980s of you. I would never cheat on Sir William . . . unless it happens to be with a Bernese Mountain Dog. They melt my heart. Never, ever mess with Will I Am!! Exactly. He is the boss around here! Been to a few shows here and normally have great fun watching the owners with their pets…. 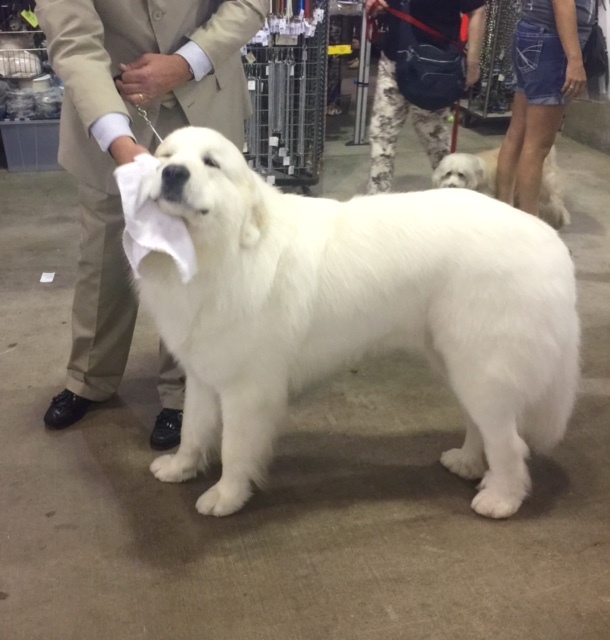 specially when they have to run with the dog in the show ring….. never seen so many different styles of running… wonder if that affects the judges that normally look like dogs themselves…. Ha! I could have done a whole section on how the contestants and judges looked like their dogs, but that would have involved photos of faces and I would hate to put anyone down. However . . . there was a woman who looked JUST LIKE her poodle . . . puffy hair and all! Have you seen the movie “Best in Show?” Brilliant. It is one of my favorites. I’ve caught a few bits of it here and there. I’ll have to check Netflix or Amazon Prime. I’d like to see it in its entirety. Thanks for the reminder. It is so good. Especially if you are a dog lover like moi. The bathing, blow drying, combing, primping, and fussing was non-stop! And that was just me before heading out to the dog show! Ha! But do they paint their claws? According to the rule book, that is not allowed. Eyelash extensions are fine, but no nail polish. You’re kidding about the eyelash extensions, right? Yikes, I hope so. Oh, wait. That was me who had the eyelash extensions done before the dog show. Well, hopefully they had sparkles on them. This was hilarious! I had no idea there was so much behind the scenes. Surely, I would have made a rookie mistake if I had a dog to show. I watched the woman with the dog comb in her hair first groom her dog, then comb her own ponytail, then tuck it in her hair. Those dog people! C.l.a.s.s.y. Gorgeous dogs. ❤ ❤ This from someone who adores cats. Are you a dog fan as well? More into cats, but my daughter’s family dog gives that look, those eyes… I turn to mush. 😀 😀 😀 See I know nothing about my daughter]s family dog. Ha! Exactly. Their eyes are so expressive! Dogs do have a way of looking doleful and forlorn, especially when asking for a treat! Ha ha ha. Sorry for the comparison, but kids know how to do that too. ❤ ❤ And I'm mush.